Memory is a complex phenomenon due to a large number of potential interactions that are associated with the organization of memory at the psychological and neural system level. In this review article a tripartite, multiple attribute, multiple process memory model with different forms of memory and its neurobiological underpinnings is represented in terms of the nature, structure or content of information representation as a set of different attributes including language, time, place, response, reward value (affect) and visual object as an example of sensory-perception. For each attribute, information is processed in the event-based, knowledge-based, and rule-based memory systems through multiple operations that involve multiple neural underpinnings. Of the many processes associated with the event-based memory system, the emphasis will be placed on short-term or working memory and pattern separation. Of the many processes associated with the knowledgebased memory system, the emphasis will be placed on perceptual processes. Of the many processes associated with the rule-based memory system the emphasis will be on short-term or working memory and paired associate learning. For all three systems data will be presented to demonstrate differential neuroanatomical mediation and where available parallel results will be presented in rodents, monkeys and humans. The structure and utilization of memory is central to one’s knowledge of the past, interpretation of the present, and prediction of the future. Therefore, the understanding of the structural and process components of memory systems at the psychological and neurobiological level is of paramount importance. There have been a number of attempts to divide learning and memory into multiple memory systems. Schacter & Tulving (1994) have suggested that one needs to define memory systems in terms of the kind of information to be represented, the processes associated with the operation of each system, and the neurobiological substrates including neural structures and mechanisms that subserve each system. Furthermore, it is likely that within each system, there are multiple forms or subsystems associated with each memory system and there are likely to be multiple processes that define the operation of each system. Finally, there are probably multiple neural structures that form the overall substrate of a memory system. Currently, the most established models of memory can be characterized as dual memory system models with an emphasis on the hippocampus or medial temporal lobe for one component of the model and a composite of other brain structures as the other component. For example, Squire (1994) and Squire et al. (2004) have proposed that memory can be divided into a medial temporal-lobe-dependent declarative memory which provides for conscious recollection of facts and events and a non-hippocampal dependent nondeclarative memory which provides for memory without conscious access for skills, habits, priming, simple classical conditioning and non-associative learning. Others have used different terms to reflect the same type of distinction, including a hippocampal dependent explicit memory versus a non-hippocampal dependent implicit memory (Schacter, 1987), and a hippocampal dependent declarative memory based on the representation of relationships among stimuli versus a non-hippocampal dependent procedural memory based on the representation of a single stimulus or configuration of stimuli (Cohen & Eichenbaum, 1993; Eichenbaum, 2004). Olton (1983) has suggested a different dual memory system in which memory can be divided into a hippocampal dependent working memory defined as memory for the specific, personal, and temporal context of a situation and a non-hippocampal dependent reference memory, defined as memory for rules and procedures (general knowledge) of specific situations. Different terms have been used to reflect the same distinction including episodic versus semantic memory (Tulving, 1983). However, memory is more complex and involves many neural systems in addition to the hippocampus. To remedy this situation, Kesner (2002) has proposed a tripartite attribute based theoretical model of memory which is organized into event-based, knowledge-based, and rule-based memory systems. Each system is composed of the same set of multiple attributes or forms of memory, characterized by a set of process oriented operating characteristics and mapped onto multiple neural regions and interconnected neural circuits (for more detail see Kesner 1998, 2002). On a psychological level (see Tables 1, 2, 3), the eventbased memory system provides for temporary representations of incoming data concerning the present, with an emphasis upon data and events that are usually personal or egocentric and that occur within specific external and internal contexts. The emphasis is upon the processing of new and current information. During initial learning, great emphasis is placed on the event-based memory system, which will continue to be of importance even after initial learning in situations where unique or novel trial information needs to be remembered. This system is akin to episodic memory (Tulving, 1983) and some aspects of declarative memory (Squire, 1994). The knowledge-based memory system provides for more permanent representations of previously stored information in long-term memory and can be thought of as one’s general knowledge of the world. The knowledge-based memory system would tend to be of greater importance after a task has been learned, given that the situation is invariant and familiar. The organization of these attributes within the knowledge-based memory system can take many forms and are organized as a set of attribute-dependent cognitive maps and their interactions, that are unique for each memory. This system is akin to semantic memory (Tulving, 1983). The rule-based memory system receives information from the event-based and knowledge-based systems and integrates the information by applying rules and strategies for subsequent action. In most situations, however, one would expect a contribution of all three systems with a varying proportion of involvement of one relative to the other.The three memory systems are composed of the same forms, domains, or attributes of memory. Even though there could be many attributes, the most important attributes include space, time, response, sensory-perception, and reward value (affect). In humans a language attribute is also added. A spatial (space) attribute within this framework involves memory representations of places or relationships between places. It is exemplified by the ability to encode and remember spatial maps and to localize stimuli in external space. Memory representations of the spatial attribute can be further subdivided into specific spatial features including allocentric spatial distance, egocentric spatial distance, allocentric direction, egocentric direction, and spatial location. A temporal (time) attribute within this framework involves memory representations of the duration of a stimulus and the succession or temporal order of temporally separated events or stimuli, and from a time perspective, the memory representation of the past. A response attribute within this framework involves memory representations based on feedback from motor responses (often based on proprioceptive and vestibular cues) that occur in specific situations as well as memory representations of stimulus-response associations. A reward value (affect) attribute within this framework involves memory representations of reward value, positive or negative emotional experiences, and the associations between stimuli and rewards. A sensory-perceptual attribute within this framework involves memory representations of a set of sensory stimuli that are organized in the form of cues as part of a specific experience. Each sensory modality (olfaction, auditory, vision, somatosensory, and taste) can be considered part of the sensory-perceptual attribute component of memory. A language attribute within this framework involves memory representations of phonological, lexical, morphological, syntactical, and semantic information. The attributes within each memory system can be organized in many different ways and are likely to interact extensively with each other, even though it can be demonstrated that these attributes do in many cases operate independent of each other. The organization of these attributes within the event-based memory system can take many forms and are probably organized hierarchically and in parallel. The organization of these attributes within the knowledge-based memory system can take many forms, are assumed to be organized as a set of cognitive maps or neural nets, and their interactions are unique for each memory. It is assumed that long-term representations within cognitive maps are more abstract and less dependent upon specific features. The organization of these attributes within the rule-based memory system can also take many forms; these are assumed to be organized to provide flexibility in executive function in developing rules, development of goals, and affecting decision processes. Within each system attribute, information is processed in different ways based on different operational characteristics. For the event-based memory system, specific processes involve (a) selective filtering or attenuation of interference of temporary memory representations of new information and is labeled pattern separation, (b) encoding of new information, (c) short-term and intermediate-term memory for new information, (d) the establishment of arbitrary associations, (e) consolidation or elaborative rehearsal of new information, and (f) retrieval of new information based on flexibility, action, and pattern completion. For the knowledge-based memory system, specific processes include (a) encoding of new information, (b) selective attention and selective filtering associated with permanent memory representations of familiar information, (c) perceptual memory, (d) consolidation and long-term memory storage partly based on arbitrary and/or pattern associations, and (e) retrieval of familiar information based on flexibility and action. For the rule-based memory system, it is assumed that information is processed through the integration of information from the event-based and knowledge-based memory systems for the use of major processes that include the selection of strategies and rules for maintaining or manipulating information for subsequent decision making and action, as well as short-term or working memory for new and familiar information, development of goals, and affecting decision processes. On a neurobiological level (see Tables 1, 2, 3) each attribute maps onto a set of neural regions and their interconnected neural circuits. For example, within the event-based memory system, it has been demonstrated that in animals and humans (a) the hippocampus supports memory for spatial, temporal and language attribute information, (b) the caudate mediates memory for response attribute information, (c) the amygdala subserves memory for reward value (affect) attribute information, and (d) the perirhinal and extrastriate visual cortex support memory for visual object attribute information as an example of a sensory-perceptual attribute and the ventral hippocampus supports memory for odor information as another example of a sensory–perceptual attribute (for more detail see Kesner, 1998, 2002). 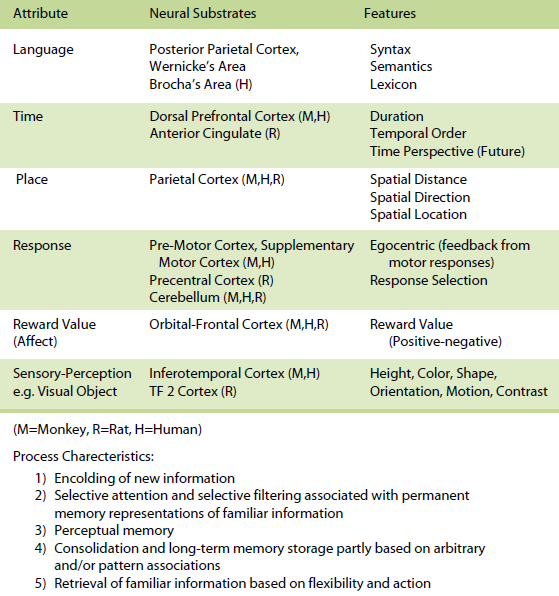 Within the knowledge-based memory system, it has been demonstrated that in animals and humans (a) the posterior parietal cortex supports memory for spatial attributes, (b) the dorsal and dorsolateral prefrontal cortex and/or anterior cingulate support memory for temporal attributes, (c) the premotor, supplementary motor, and cerebellum in monkeys and humans and precentral cortex and cerebellum in rats support memory for response attributes, (d) the orbital prefrontal cortex supports memory for reward value (affect) attributes, (e) the inferotemporal cortex in monkeys and humans and TE2 cortex in rats subserves memory for sensoryperceptual attributes (e.g. visual objects), and (f) the parietal cortex, Broca and Wernicke’s areas subserve memory for the language attribute (for more detail see Kesner, 1998, 2002). Within the rule-based memory system it can be shown that different subdivisions of the prefrontal cortex support different attributes. 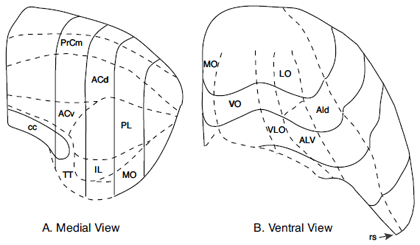 For example,( a) the dorso-lateral and ventrolateral prefrontal cortex in humans support spatial, object, and language attributes and the infralimbic and prelimbic cortex in rats supports spatial and visual object attributes, (b) the pre-motor and supplementary motor cortex in monkeys and humans and precentral cortex in rats support response attributes, (c) the dorsal, dorso-lateral, and mid-dorsolateral prefrontal cortex in monkeys and humans and anterior cingulate in rats mediate primarily temporal attributes, and (d) the orbital prefrontal cortex in monkeys and humans and agranular insular cortex in rats support affect attributes (for more detail see Kesner, 2000, 2002). Given the complexity of the nature of memory representations and the multitude of processes associated with learning and memory associated with any specific task, it is clear that prior to analyzing the neural circuits that support mnemonic processing, one must determine which attributes and which systems and associated underlying processes are essential for memory analysis of the proposed task. One example will suffice. If one assumes that the hippocampus supports the processing of the spatial attribute within the event-based memory system, then any task that minimizes the importance of the spatial attribute and emphasizes the importance of reward value, response, and sensory-perceptual attributes are not likely to involve the hippocampus. I will concentrate in this article primarily on specific processes for which there are sufficient data to determine the role of the neurobiological attribute-based model of memory for the eventbase, knowledge-based, and rule-based components of the attribute model. For the event-based memory system I will concentrate on specific processes that mediate short-term memory for new information and a selective filtering or attenuation of interference of temporary memory representations of new information which is labeled pattern separation. For the other processes including the establishment of arbitrary associations, consolidation or elaborative rehearsal of new information, and retrieval of new information based on flexibility, action, and pattern completion there is not a sufficient data set to differentiate the contribution of the different attributes associated with mnemonic processing of information. The most extensive data set is based on the use of paradigms that measure the short-term or working memory process such as matching or non-matching-to-sample, delayed conditional discrimination, continuous recognition memory of single or lists of items, and recognition memory based on exploratory information and detection of novelty. Figure 1 depicts the location of the hippocampus in the rat. 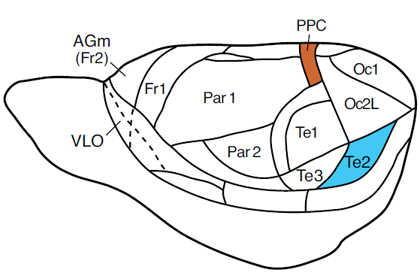 Figure 2 depicts the location of the different subregions of the hippocampus [dentate gyrus (DG), CA3, and CA1] as well as the medial and lateral perforant path inputs from the entorhinal cortex inputs into the different subregions of the hippocampus in the rat. Figure 1. 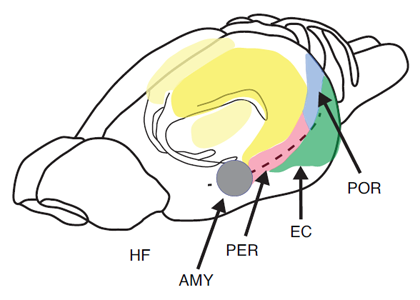 Pictorial representation of the hippocampus (HF), entorhinal cortex (EC), perirhinal cortex (PER), postrhinal cortex (POR), and amygdala (AMY) in the rat. With respect to spatial attribute information, there is extensive data that show with the use of the above mentioned paradigms to measure short-term or working memory for spatial information that there are severe impairments for rats, monkeys, and humans with right hippocampal damage or bilateral hippocampal damage (Chiba, Kesner, Matsuo, & Heilbrun, 1990; Hopkins, Kesner, & Goldstein, 1995a; Kesner, 1990; Olton, 1983, 1986; Parkinson, Murray, & Mishkin, 1988; Pigott & Milner, 1993; Smith & Milner, 1981). To examine the temporal dynamic of hippocampal involvement in short-term and intermediate-term memory in the context of processing spatial information in humans, Holdstock, Shaw, and Aggleton (1995) tested patients with hippocampal damage with a delayed matching-to-sample paradigm analogous to tasks used for rats. In this task a single stimulus was presented in a specific location and following delays of 3-40 s, the patients had to remember that location compared with a location not previously seen. The results indicated that there were no memory deficits for delays up to 20 s followed by a deficit at the 40 s delay. However, Cave and Squire (1992) found no deficits for short-term memory for a dot on a line or memory for an angle. In a different experiment, hypoxic subjects with bilateral hippocampal damage were tested on a short-term memory test to determine whether the hippocampus supports short-term or intermediate-term memory for a spatial relationship based on distance information. Control subjects and hypoxic subjects with bilateral hippocampal damage were tested for memory for spatial distance information for delays of 1, 4, 8, 12, or 16 s. The hypoxic subjects had impaired memory for distance information at the long, but not short, delays compared to normal controls (Kesner & Hopkins, 2001). Figure 2. The Hippocampal Network: The hippocampus forms a principally uni-directional network, with input from the Entorhinal Cortex (EC) that forms connections with the Dentate Gyrus (DG) and CA3 pyramidal neurons via the Perforant Path (PP – split into lateral and medial). CA3 neurons also receive input from the DG via the mossy fibres (MF). They send axons to CA1 pyramidal cells via the Schaffer Collateral Pathway (SC), as well as to CA1 cells in the contralateral hippocampus via the Associational Commissural pathway (AC). CA1 neurons also receive input directly from the Perforant Path and send axons to the Subiculum (Sb). These neurons in turn send the main hippocampal output back to the EC, forming a loop. With respect to specific spatial features, such as allocentric spatial distance, egocentric spatial distance, and spatial location, it has been shown in both rats and humans with bilateral hippocampal damage that there are severe deficits in short-term memory for these spatial features (Long & Kesner, 1996). These data are consistent with the recording of place cells (cells that increase their firing rate when an animal is located in a specific place) within the hippocampus of rats (Kubie & Ranck, 1983; McNaughton, Barnes, & O’Keefe, 1983, O’Keefe, 1983; O’Keefe & Speakman, 1987). One specific example is provided by the use of a continuous spatial recognition memory task where it has been shown that hippocampal lesions produced a profound deficit (Jackson-Smith, Kesner, & Chiba, 1993). However, it should be noted that lesions of the dorsal lateral thalamus, pre- and para-subiculum, medial entorhinal cortex and preand infra-limbic cortex produce profound deficits similar to what has been described for hippocampal lesions, suggesting that other neural regions contribute to the spatial attribute within the event-based memory system (Kesner, et al., 2001). The exact contribution of each of these areas needs to be investigated, especially because grid cells have been recorded from medial entorhinal cortex (Moser et al. 2008) and place cells have been recorded in the parasubiculum (Muller et al., 1996). Short-term memory for the spatial direction feature has also been investigated. Based on a delayed matching-to-sample task for assessing memory for direction in rats, it was shown that hippocampal lesions disrupt memory for direction (DeCoteau, Hoang, Huff, Stone, & Kesner, 2004). It should be noted that medial caudate nucleus lesions also produced an impairment in memory for direction (DeCoteau et al., 2004). Furthermore, it is likely that spatial short-term memory representations within the hippocampus might be important to amplify a subsequent consolidation process when necessary and spatial short-term memory representations within the pre-and infra-limbic prefrontal cortex might be important to engage a retrieval, action or strategy selection process. Thus, in general, the hippocampus represents some of the spatial features associated with the spatial attribute, within short-term memory. Based on a subregional analysis of hippocampal function, it appears that different subregions subserve differential roles in spatial processing of short-term memory. For example, using a paradigm developed by Poucet (1989), rats with CA3 or CA1 lesions were tested for the detection of a novel spatial configuration of familiar objects. The results indicated that CA3, but not CA1, lesions disrupted novelty detection of a spatial location (Lee, Jerman, & Kesner, 2005b). Based on the idea that the medial perforant path input into the CA3 or CA1 mediates spatial information via activation of NMDA receptors, rats received direct infusions of AP5 into the CA3 or CA1 and were tested for the detection of a novel spatial configuration of familiar objects and the detection of a novel visual object change using the same paradigm mentioned above. The results indicated that AP5 infusions into the CA3 disrupted both novelty detection of a spatial location and a visual object, whereas AP5 infusions into the CA1 disrupted novelty detection of a spatial location, but not the detection of a novel object (Hunsaker, Mooy, Swift, & Kesner, 2007). In this case, it appears the medial perforant path and the recurrent collateral system in CA3 were either actively maintaining the spatial and non-spatial information as a single behavioral episode in the network over the 3 min intersession interval or else the rich spatial context available to the rats on the test session was sufficient to guide retrieval of the previous experience to guide test performance, reflective of event-based memory processing. CA1, in the absence of recurrent circuitry, appeared to be acting directly upon the spatially rich medial perforant path inputs to retrieve the spatial information needed to perform the test. It is of interest that CA1, as opposed to CA3, did not appear to retrieve the overall behavioral episode in this case to guide retrieval, only the spatial aspects of the experience. In other research, Lee, Rao, and Knierim (2004) showed physiologically that plasticity mechanisms in CA3 were activated only when animals encountered novel spatial configurations of familiar cues for the first time. Specifically, rats were trained to circle clockwise on a ring track whose surface was composed of four different textural cues (local cues). The ring track was positioned in the center of a curtained area in which various visual landmarks were also available along the curtained walls. To produce a novel cue configuration in the environment, distal landmarks and local cues on the track were rotated in opposite directions (distal landmarks were rotated clockwise and local cues were rotated counterclockwise by equal amounts). It is well known that principal cells in the hippocampus fire when the animal occupies a certain location of space, known as the place field of the cell. Mehta and colleagues (Mehta, Barnes, & McNaughton, 1997; Mehta, Quirk, & Wilson, 2000) originally showed that the location of the CA1 place field (measured by the center of mass of the place field) changed over time (shifting backward opposite to the direction of rat’s motion) in a familiar environment as the animal experienced the environment repeatedly. When the rats encountered the changed cue configurations for the first time in the Lee et al. (2004) experiment, the CA3 place fields shifted their locations backwards prominently compared to the place fields in CA1. However, such a prominent shift was not observed in CA3 from Day 2 onwards (CA1 place fields started to exhibit a similar property from Day 2). This double dissociation in the time course of plasticity between CA1 and CA3 place fields suggests that CA3 reacts rapidly to any changed components in the environment, presumably to incorporate the novel components into an existing event-based shortterm memory system or contribute to a new representation of the environment mediated by an event-based short-term memory system if changes are significant. CA1 appears to be performing a similar function, but within an intermediateterm event-based memory system as demonstrated by the different time course than CA3, suggesting that the representation of the behavioral episode in CA1 is processed on a more lengthy timescale than in CA3. These data suggest that in some cases CA3 processes information and communicates that information to CA1 via the Schaffer collateral projections. This is similar to a finding by Hampson, Heyser, and Deadwyler (1993) who recorded ensembles of CA3 and CA1 neurons during a spatial DNMS task. They found cells responsive to spatial location, nonspatial attributes of the task, as well as cells responsive to conjunctions of spatial and nonspatial information (called conjunctive cells in their report). What is of interest is that quite often they found activity in CA1 to be highly correlated to CA3 activity, but later in time, suggesting information transfer from CA3 to CA1. Memory for duration. In this section I will concentrate on memory for duration rather than the processing of time and time perception as measured by time estimation and time-scale invariance. Previous research has indicated that fimbria-fornix lesioned rats are impaired in remembering the duration of a stimulus across a short delay interval, even though there is only a small change in estimating the passage of time (Meck, Church, & Olton, 1984; Olton, 1986; Olton, Wenk, Church, & Meck, 1988). In an attempt to replicate these results using a different paradigm, rats were trained on a short-term memory for duration task using a delayed symbolic conditional discrimination procedure (Jackson-Smith et al., 1998). It had previously been shown that rats acquire high proficiency in short-term memory for duration information (Santi & Weise, 1995). In the Jackson-Smith et al. (1998) experiment, the rats had to learn that a black rectangle stimulus that was visible for 2 s would result in a positive (go) reinforcement for one object (a ball) and no reinforcement (no go) for a different object (a bottle). However, when the black rectangle stimulus was visible for 8 s then there would be no reinforcement for the ball (no go), but a reinforcement for the bottle (go). After rats learned to respond differentially in terms of latency to approach the object, they received large (dorsal and ventral) lesions of the hippocampus, medial prefrontal cortex (anterior cingulate) lesions, or lesions of the cortex dorsal to the dorsal hippocampus. Following recovery from surgery they were retested. The results indicate that in contrast to cortical control lesions, there were major impairments following hippocampal lesions, as indicated by smaller and statistically non-significant latency differences between positive and negative trials on post-surgery tests. In order to ensure that the deficits observed with hippocampal lesions were not due to a discrimination problem, new rats were trained in an object (black rectangle) duration discrimination task. In this situation the rats were reinforced for either a 2 or 10 s exposure (duration) of the black rectangle. The stimulus was presented and remained visible for either 2 or 10 s, following which the door was raised and latency to move the stimulus was measured. Half of the animals in each group received a piece of Froot Loop on trials with a short stimulus duration and the other half were reinforced on those trials with a long stimulus duration. After rats learned to respond differentially in terms of latency to approach the object, they received large (dorsal and ventral) lesions of the hippocampus, as well as medial prefrontal cortex lesions for comparison purposes, or lesions of cortex dorsal to the dorsal hippocampus. Following recovery from surgery the rats were retested. The results indicate that after hippocampal lesions there was an initial deficit followed by complete recovery. Thus, the hippocampus mediates memory for duration, but does not mediate duration discrimination. The data are consistent with previous research that indicates that fimbriafornix rats are impaired in remembering the duration of a stimulus across a short delay interval, even though there is only a small change in estimating the passage of time (Meck, Church, & Olton, 1984; Olton, 1986; Olton et al., 1988). Furthermore, it has been suggested that trace conditioning requires memory for the duration of the conditioned stimulus. Thus, it is of importance to note that rabbits with hippocampal lesions are impaired in acquisition (consolidation) of trace but not delayed eye-blink conditioning (Moyer, Deyo, & Disterhoft, 1990). Based on a subregional analysis of hippocampal function, it can be shown that the dorsal CA1 supports object-trace odor paired associate learning (Kesner et al., 2005), but both the dorsal CA1 and CA3 support object trace-place paired associate learning (Hunsaker et al., 2006) and the ventral CA1 supports trace fear conditioning (Rogers et al., 2006). It should be noted that the hippocampus is not directly involved in representing memory information concerning specific objects (Bussey, Saksida, & Murray, 2002; Kesner, Bolland, & Dakis, 1993; Mumby & Pinel, 1994; Norman & Eacott, 2004). To what extent can one generalize from hippocampal function in rats to humans with respect to memory representation of duration as one feature of temporal attribute information? To answer this question, a number of experiments were conducted using humans that were exposed to hypoxia due to a variety of causes, but primarily carbon monoxide poisoning (Hopkins & Kesner, 1994; Hopkins et al., 1995a). These subjects have anterograde amnesia and, based on MRI data, have bilateral damage to the hippocampus, but no detectable damage to the entorhinal cortex, parahippocampal gyrus, or temporal cortex. They also show no signs of prefrontal cortex dysfunction based on normal performance on tests of fluency and Wisconsin Card sorting. The hypoxic subjects with hippocampus damage and age matched controls were tested for short-term memory for duration of a visual object. Subjects were presented with a single object (square, circle, etc) on a computer screen for a duration of 1 or 3 s. They were instructed to remember the duration of presentation of the object. After a delay of 1, 4, 8, 12, 16, or 20 s, the same object appeared for the same or different duration. The subjects were asked to indicate whether the duration was the same or different from the duration shown in the study phase. The results indicate that the hypoxic subjects were impaired relative to control damaged subjects in short-term memory for duration for all but the shortest delay (Kesner & Hopkins, 2001). In order to determine whether the deficits may have been due to impaired memory for the objects per se, a control task was administered to the same subjects. They were presented with a single object for 1 or 3 s and were asked to remember the object. After a delay of 1, 4, 8, 12, 16, or 20 s either the identical or a different object appeared on the screen. The subjects were asked if it was the same or a different object. The results indicate that there were minimal differences between the hypoxic and control subjects (Kesner & Hopkins, 2001). The impairment could not be due to an inability to estimate time accurately, because in an additional experiment with objects the subjects were asked to estimate the time elapsed before each of the 1, 4, 8, 12, 16, 20 s delay intervals. The results indicate that for hypoxic subjects, time estimates were accurate up to 8 s followed by some underestimation with longer delays, so that short-term memory for the duration of 1 or 3 s stimulus exposure could not be due to difficulty in estimating time (Kesner & Hopkins, 2001). The process of estimating time may not require active participation of short-term memory and may, therefore, appear to be independent of short-term memory for the duration of exposure of a stimulus. Rat data are also consistent with previous research which indicated that humans with hypoxia resulting in bilateral hippocampal damage are impaired in acquisition (consolidation) of trace but not delayed eye-blink conditioning (Disterhoft, Carrillo, Hopkins, Gabrieli, & Kesner, 1996). Thus, the results suggest that like rodents, humans with hippocampal damage have difficulty in representing short-term memory for duration of an object, but not short-term memory for a single object. Memory for sequential spatial information. In order to examine sequential learning of spatial information, a task was developed in which rats were required to remember multiple places. During the study phase, rats were presented with four different places within sections that were sequentially visited by opening of one door to a section at a time on a newly devised maze (i.e., Tulum maze). Each place was cued by a unique object that was specifically associated with each location within the section during the study phase. Following a 15 s delay and during the test phase, one door to one section would be opened and in the absence of the cued object in that section, rats were required to recall and revisit the place within that section of the maze that had been previously visited. Once animals were able to reliably perform this short-term episodic memory task, they received lesions to either CA3 or CA1 subregions of the hippocampus. Both CA1 and CA3 lesions disrupted accurate relocation of a previously visited place (Lee et al., 2005a). In a different task, rats learned trial-unique sequences of spatial locations along a runway box. Each trial consisted of a study phase made up of the presentation of a linear sequence of four spatial locations marked by neutral blocks. After a 30 s interval, the animal was given the test phase. The test phase consisted of the same sequence presented during the study phase, but although one of the spatial locations was not marked by a block, it still contained a reward. The unmarked spatial location was pseudo-randomly distributed equally between the first, second, third, and fourth item in the sequence. To receive a reward, the rat had to visit the correct, unmarked spatial location. Once animals were able to reliably perform this short-term event-based memory task, they received lesions to either CA3 or CA1. Animals with lesions to either CA3 or CA1 had difficulty with short-term event-based memory processing, although CA1 lesioned animals had a much greater deficit. However, when animals were trained on a fixed version of the same task, hippocampal lesions had no effect. These results suggest that CA3 and CA1 both contribute to short-term event-based memory processing, since lesions to CA3 or CA1 result in an inability to process spatial information within the event-based memory system, whereas they have no effect on non-event-based memory information processing (Hunsaker et al., 2008). In order to determine temporal order memory for visual objects, we used a paradigm described by Hannesson, Howland, and Phillips (2004). This paradigm involves long duration study phases (on the order of minutes) and long duration tests (also on the order of minutes) for temporal preference and thus it is likely to involve more directly the intermediate-term event-based memory processes we have proposed for CA1. In this experiment, rats with CA3 or CA1 lesions were placed inside a box to explore each set of three objects (referred to as A-A, B-B, and C-C) for 5 min with a 3 min inter-session interval. After the third set of objects, the rats were given a 3 min time-out after which one of the two A objects and one of the two C objects were placed in opposite ends of the box. The rats were then returned to the box to measure preference for A versus C for 5 min. On a subsequent day with new objects, the same animals were tested for detection of a novel object as a control using the same procedure previously described with the exception that one of the two A objects and one new object D were placed in opposite ends of the box to measure preference for A versus D for 5 min. All rats were tested once in the A-C preference test (temporal order) and on the A-D preference test (detection of object novelty) for a total of 2 days of testing. The results indicated that CA1 lesions impaired choice (they preferred C over A), but CA3 lesioned rats showed the same preference as controls (they preferred A over C). All groups preferred D in the novelty test (Hoge & Kesner, 2007; Hunsaker et al., 2008). The data indicate that controls prefer A rather than C. In order to explain this preference for A, it is assumed that rats prefer A because the rat has had more time for consolidation within an intermediate-term event-based memory operation for object A in comparison with object C and thus has greater memory strength for object A. Furthermore, CA1, but not CA3, lesioned rats prefer C suggesting an impairment for CA1, but not CA3, in temporal order memory for visual objects. A possible explanation for the observation that CA1 lesioned rats prefer C rather than A is based on the assumption that the trace of A has not been consolidated properly and thus may be difficult to retrieve, but C may still be processed by the short-term event-based memory system mediated by CA3. Thus, the rat prefers C because of a short-term recency effect. This would also explain the lack of deficit observed following a lesion of CA3. Using the same paradigm as described above but with shorter delays to examine the effects of dorsal and ventral CA1 lesions on temporal and novelty processing of visual objects, odor, and spatial location information revealed that memory for temporal order information for visual objects is impaired following dorsal and ventral CA1 lesions, for odors following ventral CA1, but not dorsal CA1 lesions, and for spatial locations for dorsal CA1, but not ventral CA1 lesions (Hunsaker et al., 2008). Thus, CA1 appears to be involved in separating events in time for spatial and nonspatial information, so that one event can be remembered distinctly from another event, but ventral CA1 might play a more important role than dorsal CA1 for odor information. There were no disruptive effects for dorsal or ventral CA1 lesions on novelty detection for odors, spatial locations, and objects (Hunsaker et al., 2008). It has been shown, however, that lesions to CA3 eliminate any preference for one spatial location over another, suggesting CA3 is also involved in temporal ordering for spatial locations, but only insofar as the information to be temporally processed is spatial in nature. With respect to response attribute information, it can be shown that with the use of the above mentioned paradigms to measure short-term memory, that for rats with caudateputamen lesions and humans with caudate-putamen damage due to Huntington’s disease (HD), there are profound deficits for a right or left turn response or a list of hand motor movement responses (Cook & Kesner, 1988; Davis, Filoteo, Kesner, & Roberts, 2003; Kesner et al., 1993; Figure 3 depicts the location of the caudate nucleus in the rat). For example, it has been shown that electrolytic induced caudate lesions in rats impair short-term or working memory for a specific motor response (right-left turn) without any impairments in memory for a visual object or for a spatial location (Kesner et al., 1993). Similarly, a lack of effects has been reported following medial caudate lesions in working memory performance for spatial locations on an 8 arm maze (Colombo, Davis, & Volpe, 1989; Cook & Kesner, 1988). A similar pattern of results has been reported following dysfunction of the caudate nucleus in patients with HD. For example, Davis et al. (2003) administered tests of spatial and motor working memory to a small group of HD patients. During the study phase of the spatial memory task, subjects were shown a subset of six stimulus locations (X’s) randomly selected from a set of 16 and presented in a sequential manner. Immediately following the study phase, the test phase was presented. During the test phase, two stimulus locations (X’s) were presented simultaneously. The subject was asked to indicate which one they had seen during the study phase. During the study phase of the hand position memory task, subjects were shown sequential presentations of six hand positions randomly selected from a set of 16 and were asked to imitate the hand position in the display. On the test phase, subjects were shown two pictures of different hand positions and were asked to determine which one they had seen in the study phase. The results of this study indicate that, relative to normal controls, the HD patients are differentially impaired in the motor memory task as compared to the spatial memory task. Interestingly, in two studies, Pasquier, et al. (1994) and Davis, Filoteo and Kesner (2007) demonstrated that HD patients were impaired on a task requiring them to recall the spatial distance of the displacement of a handle on the apparatus. The results of the above mentioned studies, suggest that patients with HD and rats with caudate lesions are impaired on working-memory tasks, particularly when the task places a heavy demand on motor information. Additional data based on a patient with a caudate nucleus lesion showed a decrease in accuracy of memory-guided saccades implying that the caudate nucleus mediates spatial short term memory for eye movements (Vermersch et al., 1999). Figure 3. Pictorial representation of the caudate nucleus in the rat. Furthermore, rats, monkeys, and humans with caudate lesions have deficits in tasks like delayed response, delayed alternation, and delayed matching to position (Divac, Rosvold, & Szwarcbart, 1967; Dunnett, 1990; Oberg & Divac, 1979; Partiot et al., 1996; Sanberg, Lehmann, & Fibiger, 1978). One salient feature of delayed response, delayed alternation, and delayed matching to position tasks is the maintenance of spatial orientation to the baited food, relative to the position of the subject’s body, often based on proprioceptive and vestibular feedback. These data suggest that the caudateputamen plays an important role in short-term memory representation for the feedback from a motor response feature of response attribute information. The memory impairments following caudate-putamen lesions are specific to the response attribute, because these same lesions in rats do not impair short-term memory performance for spatial location, visual object, or affect attribute information (Kesner et al., 1993; Kesner & Williams, 1995). With respect to affect attribute information, it can be shown that with the use of the above mentioned paradigms to measure short-term memory, that for rats with amygdala lesions and humans with amygdala damage there are major deficits for reward value associated with magnitude of reinforcement or for a liking response based on the mere exposure of a novel stimulus (Kesner & Williams, 1995; Chiba, Kesner, Matsuo, & Heilbrun, 1993), suggesting that the amygdala plays an important role in short-term memory representation for reward value as a critical feature of the affect attribute. Figure 1 depicts the location of the amygdala in rats. Since very few studies have measured the role of the amygdala in mediating short-term memory for affect, it was necessary to develop a new task (Kesner & Williams, 1995). In the study phase of the task, rats were given one of two cereals – one cereal contained 25% sugar, the other 50% sugar. One of the two cereals was always designated as the positive stimulus and the other as the negative stimulus. This study phase was followed by the test phase, in which the rat was shown an object which covered a food well. If the rat was given the negative food stimulus during the study phase, no food was placed beneath the object. If the rat was given the positive food stimulus during the study phase, another food reward was placed beneath the object. Latency to approach the object was used as the dependent measure. Rats learn to approach the objects quickly when they expect a reward and they are slow to approach the object when they expect no reward. After they reached criterion of at least a 5 s difference between the positive and negative trials, the rats were given amygdala or control lesions. The results indicate that in contrast to controls, the amygdala lesioned rats displayed a deficit in performance as indicated by smaller latency differences between positive and negative trials on post-surgery tests. This deficit persisted at both short and long delays. In additional experiments, it was shown that the amygdala lesioned rats, like controls, had similar taste preferences and transferred readily to different cereals containing 25% or 50% sugar. A similar result was reported by Kesner, Walser, and Winzenried (1989), who showed that amygdala lesioned rats were impaired in short-term memory performance for 1 versus 7 pieces of food associated with different spatial locations on an 8 arm maze. Thus, the amygdala appears to mediate short-term affect-laden information based on the reward value (magnitude) of reinforcement. To what extent can one generalize from amygdala function in rats to humans with respect to affect attribute information? Previous research has shown that bilateral damage to the amygdala in humans impairs recognition of affect embedded within facial expressions (Adolphs, Tranel, Damasio, & Damasio, 1994). In order to elaborate further on the role of the amygdala in humans, Chiba et al. (1993) developed a liking test based on the mere exposure effect described by Zajonc (1968). Based on this principle, a computerized liking task was designed to test the presence of the mere exposure effect. The liking task consisted of eight abstract pictures and eight unknown words that were sequentially presented on the computer screen. Following the individual presentation of each of these 16 study stimuli, 16 liking trials were presented. In each liking trial, two stimuli – one study stimulus and a matched lure – were simultaneously presented on the computer screen. Subjects were then asked which of the two stimuli they liked better. Four groups of subjects were tested on this task — college students as control subjects, subjects with partial complex epilepsy of temporal lobe origin, subjects who had undergone unilateral temporal lobe resections, including the temporal cortex and the hippocampus, and subjects who had undergone unilateral temporal lobe resections including the temporal cortex, hippocampus, and amygdala. Results indicated that for mean percent preference for abstract pictures and words, all subject groups showed a stable liking or mere exposure effect for both sets of stimuli, with the exception of those who sustained amygdala damage. It appears that the integrity of the amygdala is critical to the existence of the liking effect. Thus, it is likely that the amygdala of animals and humans is involved in a short-term memory representation of the affective quality and quantity (reward value) of stimuli. This idea is an extension of earlier theoretical notions that the amygdala is involved in the interpretation and integration of reinforcement (Weiskrantz, 1956), serves as a reinforcement register (Douglas & Pribram, 1966), mediates stimulus-reinforcement associations (Jones & Mishkin, 1972) and serves to associate stimuli with reward value (Gaffan, 1992). With respect to sensory-perceptual attribute information, I will concentrate on visual object information as an exemplar of memory representation of the sensory-perceptual attribute. Figure 4 depicts the location of the perirhinal cortex in the rat. It can be shown that with the use of the above mentioned paradigms to measure short-term memory, that there are severe impairments in visual object information for rats and monkeys with extra-striate or perirhinal cortex lesions (Bussey et al., 2002; Gaffan & Murray, 1992; Horel, Pytko-Joiner, Boytko, & Salsbury, 1987; Kesner et al., 1993; Mumby & Pinel, 1994; Norman & Eacott, 2004; Suzuki, Zola-Morgan, Squire, & Amaral, 1993), suggesting that the extra-striate and perirhinal cortex play an important role in short-term memory representation for visual object information as an exemplar of the sensory-perceptual attribute. Further support derives from single unit studies in rats and monkeys which indicate that activity of neurons in the rhinal cortex reflect stimulus repetition which is an integral part of the delayed non-matching to sample tasks used to measure short-term recognition memory for objects (Zhu, Brown, & Aggleton, 1995). visual object. The results indicate that naloxone infusions into the CA3 disrupted novelty detection of a spatial location and a visual object, but naloxone injections into CA1 disrupted novelty detection for a visual object, but not for a spatial location (Hunsaker et al., 2007). The primary implication of these data is that CA3 is capable of simultaneous processing of both spatial (“where”) and nonspatial (“what”) elements of event-based memory. Based on the idea that the medial perforant path inputs into CA3 mediate spatial location information (i.e. “where” information) via activation of NMDA receptors, rats received direct infusions of AP5 (an NMDA antagonist) into CA3 and were tested for the detection of a novel spatial configuration of familiar objects and the detection of a novel visual object. The results indicate that NMDA infusions into the CA3 disrupted novelty detection of a spatial location and a visual object, but NMDA injections into CA1 disrupted novelty detection for a spatial location, but not for a visual object (Hunsaker et al, 2007). Disruption of either medial perforant path (NMDA-ergic) or lateral perforant path (μ opioid-ergic) plasticity resulted in spatial and novel object detection deficits. In CA1, it appears that the spatial and nonspatial elements are processed separately. Disrupting the lateral perforant path by infusing naloxone was sufficient to disrupt novel object detection, but not sufficient to disrupt detection of a spatial change. These data suggest that CA3, but not CA1, is critically important for spatial/nonspatial associative binding critical for eventbased memory. Similar to the argument provided earlier, it appears that CA3 is involved in rapid spatial and nonspatial information binding into coherent behavioral episodes in the time-scale of this task (each episode is of approximately 6 min duration). When CA3 is disrupted, the rat fails to retrieve any elements of the event. This is in contrast to CA1, where it appears that CA1 is involved in temporally tagging information into events, and that this is carried out upon each type of information separately (e.g., spatial and nonspatial information). Thus a disruption to nonspatial information disrupts only nonspatial processing in CA1. With respect to language attribute information, it can be shown that with the use of the above mentioned paradigms to measure short-term memory that there are severe impairments for lists of words for humans with left hippocampal or bilateral hippocampal damage (Hopkins, Kesner, & Goldstein, 1995b), suggesting that the hippocampus plays an important role in short-term memory representation of word information as an important feature of language attribute information. There is a good deal of evidence supporting the idea of important lateralization for hippocampal function in humans with the right hippocampus representing spatial information and the left hippocampus representing linguistic information (Milner, 1971; Smith & Milner, 1981). For example, Milner tested patients who had left or right temporal lobectomies on a task of recall for a visual location. In this task subjects made a mark on an 8 in line in order to reproduce as close as possible the exact position of the previously shown circle. Subjects with right temporal lobe lesions were impaired on this task, whereas subjects with left temporal lobe lesions were not significantly different from control subjects. Smith and Milner (1981) tested patients with right and left temporal lobectomies and control subjects on a memory task involving incidental recall of the locations of the objects. Subjects were asked to estimate the prices of several objects which were placed in a spatial array on a test board. After a short or 24 h delay, subjects were asked to place the objects in their appropriate locations. Left temporal lobe and control subjects performed well on this task at both the immediate and delayed recall of the object locations. Right temporal lobe subjects were impaired for both the immediate and delayed recall of the object locations. Even though hypoxic subjects or left temporal resected patients are impaired for new linguistic information, they are not impaired when they can use semantic or syntactic information to remember the order of presentation of syntactically and semantically meaningful sentences (Hopkins et al., 1995b). Pattern separation is defined as a process to remove redundancy from similar inputs so that events can be separated from each other and interference can be reduced and in addition can produce a more orthogonal, sparse, and categorized set of outputs. The determination of a spatial pattern separation process has been developed extensively by computational models of the subregions of the hippocampus with a special emphasis on the dentate gyrus (DG). Based on the empirical findings that all sensory inputs are processed by the DG subregion of the hippocampus ((Aggleton, Hunt, & Rawlins, 1986; Jackson-Smith et al., 1993; Kesner et al., 1993; Mumby, Wood, & Pinel, 1992; Otto & Eichenbaum, 1992), it has been suggested that a possible role for the hippocampus might be to provide for sensory markers to demarcate a spatial location, so that the hippocampus can more efficiently mediate spatial information. It is thus possible that one of the main process functions of the hippocampus is to encode and separate spatial events from each other. This would ensure that new highly processed sensory information is organized within the hippocampus and enhances the possibility of remembering and temporarily storing one place as separate from another place. It is assumed that this is accomplished via pattern separation of event information, so that spatial events can be separated from each other and spatial interference reduced. This process is akin to the idea that the hippocampus is involved in orthogonalization of sensory input information (Rolls, 1989), in representational differentiation (Myers, Gluck, & Granger, 1995), and indirectly in the utilization of relationships (Cohen & Eichenbaum, 1993). Rolls’ (1996) model proposes that pattern separation is facilitated by sparse connections in the mossy-fiber system, which connects DG granular cells to CA3 pyramidal neurons. Separation of patterns is accomplished based on the low probability that any two CA3 neurons will receive mossy fiber input synapses from a similar subset of DG cells. Mossy fiber inputs to CA3 from DG are suggested to be essential during learning and may influence which CA3 neurons fire based on the distributed activity within the DG. Cells of the DG are suggested to act as a competitive learning network with Hebb-like modifiability to reduce redundancy and produce sparse, orthogonal outputs. O’Reilly & McClelland (1996) and Shapiro & Olton (1994) also suggested that the mossy fiber connections between the DG and CA3 may support pattern separation. To examine the contribution of the DG to spatial pattern separation, Gilbert, Kesner, and Lee (2001) tested rats with DG lesions using a paradigm which measured short-term memory for spatial location information as a function of spatial similarity between spatial locations. Specifically, the study was designed to examine the role of the DG subregion in discriminating spatial locations when rats were required to remember a spatial location based on distal environmental cues and to differentiate between the to-be-remembered location and a distractor location with different degrees of similarity or overlap among the distal cues. Animals were tested using a cheeseboard maze apparatus (the cheese board is similar to a dry land water maze with 177 circular, recessed holes on a 119 cm diameter board) on a delayed-match-to-sample for a spatial location task. Animals were trained to displace an object which was randomly positioned to cover a baited food well in 1 of 15 locations along a row of food wells. Following a short delay, the animals were required to choose between objects which were identical to the sample phase object: one object was in the same location as the sample phase object and the second object was in a different location along the row of food wells. Rats were rewarded for displacing the object in the same spatial location as the sample phase object (correct choice), but they received no reward for displacing the foil object (incorrect choice). Five spatial separations, from 15 cm to 105 cm, were used to separate the correct object and the foil object during the choice phase. Rats with DG lesions were significantly impaired at short spatial separations; however, during the choice phase, performance of DG-lesioned animals increased as a function of greater spatial separation between the correct and foil objects. The performance of rats with DG lesions matched control rats at the largest spatial separation. The graded nature of the impairment and the significant linear improvement in performance as a function of increased separation illustrate a deficit in pattern separation. Based on these results, it was concluded that lesions of the DG decrease the efficiency of spatial pattern separation, which results in impairments on trials with increased spatial proximity and increased spatial similarity among working memory representations. Holden, Hoebel, Loftis, and Gilbert (2012) used an analogous task to that used for rats (Gilbert et al., 2001) to test young participants compared to aged participants who are likely to have DG dysfunction (see Small, et al., 2011). They report that aged participants that do not perform well on standard memory tests are impaired in displaying a pattern separation function. One limitation of the dot task is that it does not assess the ability to separate spatial patterns in the real world. In order to assess real world spatial pattern separation, hypoxic subjects with hippocampal damage and matched normal controls were administered a geographical spatial distance task (cities on a map; Hopkins & Kesner, 1993). The subjects were shown 8 cities on a map of New Brunswick, one at a time, for 5 s each. Subjects were instructed to remember the city and its spatial location on the map. In the test phase, the subjects were presented with the names of two cities that occurred in the study phase and were asked which of the cities was located further to the east (on separate trials, subjects were asked which city occurred further north, south, or west). There were two trials for each compass direction. Spatial distances of 0, 2, 4, and 6 as measured by the number of cities in the study phase that were geographically situated between the two test cities were measured. There were 8 trials for each distance. The hypoxic subjects were impaired for all spatial distances for spatial geographical information compared to control subjects (Hopkins & Kesner, 1993). Thus, the DG may function to encode and to separate locations in space to produce spatial pattern separation. Such spatial pattern separation ensures that new highly processed sensory information is organized within the hippocampus, which in turn enhances the possibility of encoding and temporarily remembering one spatial location as separate from another. Based on the observations that cells in CA3 and CA1 regions respond to changes in metric and topological aspects of the environment (Jeffery & Anderson, 2003; O’Keefe & Burgess, 1996), one can ask whether these different features of the spatial environment are processed via the DG and then are subsequently transferred to the CA3 subregion or if these features are communicated via the direct perforant path projection to the CA3 subregion. In both cases, information may then be transferred to the CA1 subregion. To answer this question, Goodrich-Hunsaker, Hunsaker, and Kesner (2005) examined the contributions of the DG to memory for metric spatial relationships. Using a modified version of an exploratory paradigm developed by Poucet (1989), rats with DG, CA3, and CA1 lesions as well as controls, were tested on tasks involving a metric spatial manipulation. In this task, a rat was allowed to explore two different visual objects separated by a specific distance on a cheeseboard maze. On the initial presentation of the objects, the rat explored each object. However, across subsequent presentations of the objects in the same spatial locations, the rat habituated and eventually spent less time exploring the objects. Once the rat had habituated to the objects in their locations, the metric spatial distance between the objects was manipulated so that the two objects were either closer together or farther apart. The time the rat spent exploring each moved object was recorded. The results showed that rats with DG lesions spent significantly less time exploring the two objects that were displaced relative to controls, indicating that DG lesions impair the detection of metric distance changes. Rats with CA3 or CA1 lesions displayed mild impairments relative to controls, providing empirical validation for the role of DG in spatial pattern separation and support the predictions of computational models (Rolls, 1996; Rolls & Kesner, 2006). Stark, Yassa, and Stark (2010) used an analogous task to that used for rats (Goodrich-Hunsaker et al., 2005) to measure spatial pattern separation based on distance, and in this case angle as well, to test young and healthy aging humans. Even though there were some individual differences, they reporedt an impairment in spatial pattern separation. Also, Baumann, Chan, and Mattingley (2012) reported activation of the posterior hippocampus in spatial pattern separation using the task used by Goodrich-Hunsaker et al. (2005). Based on the observation that neurogenesis occurs in the DG and that new DG granule cells can be formed over time, it has been proposed that the DG mediates a spatial patternseparation mechanism as well as generates patterns of episodic memories within remote memory (Aimone, Wiles, & Gage, 2006). Thus far, it has been shown in mice that disruption of neurogenesis using low-dose x-irradiation was sufficient to produce a loss of newly born DG cells. Further testing indicated impairments in spatial learning in a delayed non-matching-to-place task in the radial arm maze. Specifically, impairment occurred for arms which were presented with little separation, but no deficit was observed when the arms were presented farther apart, suggesting a spatial pattern separation deficit. Also, the disruption of neurogenesis using lentivirus expression of a dominant Wnt protein produced a loss of newly born DG cells, as well, and was observed in an associative object-in-place task with different spatial separations as a function of the degree of separation, again suggesting a spatial pattern separation deficit (Clelland et al., 2009). These data suggest that neurogenesis in the DG may contribute to the operation of spatial pattern separation. Thus, spatial pattern separation may play an important role in the acquisition of new spatial information and there is a good possibility that the DG may be the subregion responsible for the impairments in the various tasks described above. There are data to support the existence of memory for order information, but it is not always clearly demonstrated whether memory for a particular sequence has been learned and can be accurately recalled. Estes (1986) summarized data demonstrating that, in human memory, there are fewer errors for distinguishing items (by specifying the order in which they occurred) that are far apart in a sequence than those that are temporally adjacent. Other studies have also shown that order judgments improve as the number of items in a sequence between the test items increases (Banks, 1978; Chiba, Kesner, & Reynolds, 1994; Madsen & Kesner, 1995). This phenomenon is referred to as a temporal distance effect [sometimes referred to as a temporal pattern separation effect (Kesner, Lee, & Gilbert, 2004)]. The temporal distance effect is assumed to occur because there is more interference for temporally proximal events than for temporally distant events. Based on these findings, Gilbert et al. (2001) tested rodents memory for the temporal order of items in a one-trial sequence learning paradigm. In the task, each rat was given one daily trial consisting of a sample phase followed by a choice phase. During the sample phase, the animal visited each arm of an 8-arm radial maze once in a randomly predetermined order and was given a reward at the end of each arm. The choice phase began immediately following the presentation of the final arm in the sequence. In the choice phase, two arms were opened simultaneously and the animal was allowed to choose between the arms. To obtain a food reward, the animal had to enter the arm that occurred earlier in the sequence that it had just followed. Temporal separations of 0, 2, 4, and 6 were randomly selected for each choice phase. These values represented the number of arms in the sample phase that intervened between the arms that were to be used in the test phase. After reaching criterion, rats received CA1 lesions. Following surgery, control rats matched their preoperative performance over all temporal separations. In contrast, rats with CA1 lesions performed at chance across 0, 2, or 4 temporal separations and a little better than chance in the case of a separation of 6 items. The results suggest that the CA1 subregion is involved in memory for spatial location as a function of temporal separation of spatial locations; lesions of the CA1 decrease efficiency in temporal pattern separation. CA1 lesioned rats cannot separate events over time, perhaps due to an inability to inhibit interference that may be associated with sequentially occurring events. The increase in temporal interference impairs the rat’s ability to remember the order of specific events. Tolentino et al. (2012) used an analogous task to that used for rats (Gilbert et al., 2001) to test young compared to non-demented older participants in a spatial temporal pattern separation task and report temporal pattern separation problems for the older participants. In another spatial location task, patients with a hypoxic condition and hippocampal damage were impaired in displaying a temporal pattern separation function (Hopkins et al., 1995a). In a more recent experiment using a paradigm described by Hannesson et al. (2004), it was shown that temporal order information for spatial location was impaired only for CA1 (Hunsaker et al., 2008). Thus, it can be suggested that the CA1 hippocampal subregion serves as a critical substrate for sequence learning and temporal pattern separation for the spatial attribute. It has been suggested that the perirhinal cortex and CA1 subregion of the hippocampus plays an important role in supporting temporal processing of visual object information (Hoge & Kesner, 2007; Hunsaker et al., 2008). In humans it can be shown that a temporal pattern separation process can be observed in hypoxic patients in a temporal order test memory test for abstract figures (Hopkins et al., 1995a), suggesting that the hippocampus may also play a role in temporal pattern separation for visual stimuli, at least in humans. Does the hippocampus support temporal pattern separation processes for sensory-perceptual information other than space and visual objects? To answer this question, memory for the temporal order for a sequence of odors was assessed in rats based on a varied sequence of five odors, using a similar paradigm described for sequences of spatial locations. Kesner, Gilbert, and Barua (2002) found that rats with hippocampal lesions were impaired relative to control animals for memory for all temporal distances between the odors, despite an intact ability to discriminate between the odors. Fortin, Agster, and Eichenbaum (2002) reported similar results with fimbria fornix lesions. In a further subregional analysis, rats with dorsal CA1 lesions showed a mild impairment in memory for the temporal distance for odors, but rats with ventral CA1 lesions showed a severe impairment (Kesner, Hunsaker, & Ziegler, 2010). Thus, the CA1 appears to be involved in separating events in time for spatial and nonspatial information, so one event can be remembered distinctly from another event; however, the dorsal CA1 might play a more important role than the ventral CA1 for spatial information (Chiba, Johnson, & Kesner, 1992), and conversely the ventral CA1 might play a more important role than the dorsal CA1 for odor information. The mechanism that could subserve the above mentioned findings is based on the memory question that asks which of two items occurred earlier in the list. To implement this type of memory, some temporally decaying memory trace or temporally increasing memory trace via a consolidation process might provide a model (Marshuetz, 2005); in such a model, temporally adjacent items would have memory traces of more similar strength and would be harder to discriminate than the strengths of the memory traces of more temporally distant items. A delayed-match-to-sample task was used to assess memory for motor responses in rats with control, hippocampus, or medial caudate nucleus (MCN) lesions. All testing was conducted on a cheeseboard maze in complete darkness using an infrared camera. A start box was positioned in the center of the maze facing a randomly determined direction on each trial. In the sample phase, a phosphorescent object was randomly positioned to cover a baited food well in 1 of 5 equally spaced positions around the circumference of the maze forming a 180-degree arc 60 cm from the box. On each trial, the door to the start box was opened, the rat exited, displaced the object to receive food, and returned to the box. The box was then rotated to face a different direction. The food well in the same position relative to the box was baited and an identical phosphorescent object was positioned to cover the well. A second identical object was positioned to cover a different unbaited well. On the choice phase, the rat was allowed to choose between the 2 objects. The object in the same position relative to the start box as the object in the sample phase was the correct choice and the foil object was the incorrect choice. The rat must remember the motor response made on the sample phase and make the same motor response on the choice phase to receive a reward. Four separations of 45, 90, 135, and 180 degrees were randomly used to separate the correct object from the foil in the choice phase. Hippocampus-lesioned and control rats improved as a function of increased angle separation and matched the performance of controls. However, rats with MCN lesions were impaired across all separations (Kesner & Gilbert, 2006). Results suggest that the MCN, but not the hippocampus, may support working memory and/or a process aimed at reducing interference for motor response selection based on vector angle information. Male Long-Evans rats were tested on a modified version of Flaherty, Turovsky, & Krauss’ (1994) anticipatory contrast paradigm, to assess pattern separation for reward value. Prior to testing, each rat received either a control, hippocampal, or amygdala lesion. In the home cage, each rat was allowed to drink a water solution containing 2% sucrose for 3 min followed by a water solution containing 32% sucrose for 3 min. Over 10 days of testing, the rats in each lesion group showed significantly increased anticipatory discriminability as a function of days. In order to assess the operation of a pattern separation mechanism, each rat was then tested using the same procedure, except the 2% solution was followed by a 16% solution for 10 days and then by an 8% solution for 10 days. Control and hippocampal-lesioned rats continued to show high discriminability when the 2% solution was followed by a 16% solution, however, the amygdala-lesioned rats showed low anticipatory discriminability. On trials where the 2% sucrose solution was followed by an 8% sucrose solution, all groups showed low discriminability scores, suggesting that when two reward values are very similar, even control animals are not able to separate the reward values in memory. However, the results of a preference task revealed that all groups can perceptually discriminate between a 2% and an 8% sucrose solution (Gilbert & Kesner, 2002). The data suggest that the amygdala, but not the hippocampus, is involved in the separation of patterns based on reward value. In order to determine whether the perirhinal cortex plays a role in object-based pattern separation, rats with perirhinal cortex, hippocampal, or sham lesions were trained on a successive discrimination go/no-go task to examine recognition memory based on pattern separation for an array of visual objects with varying interference among the objects in the array. Rats were trained to recognize a target array consisting of four particular objects that could be presented in any one of four possible configurations to cover baited food wells. If the four target objects were presented, the rat should displace each object to receive food. However, if a novel object replaced any one or more of the target objects, then the rat should withhold its response. The number of novel objects presented on non-rewarded trials varied from one to four. The fewer the number of novel objects in the array, the more interference the array shared with the target array, therefore increasing task difficulty, requiring an object pattern separation mechanism to solve the task. The results indicated that an increased number of novel objects resulted in a pattern separation effect with less interference for the target array as indicated by decreased task difficulty. Although accuracy was slightly lower in rats with hippocampal lesions, compared to controls, the learning of the groups was not statistically different. In contrast, rats with perirhinal cortex lesions were significantly impaired in utilizing a pattern separation function compared to both control and hippocampal-lesioned rats (Gilbert & Kesner, 2003). The results suggest that temporal pattern separation for objects is affected by stimulus interference in rodents and is mediated by the perirhinal cortex. Other research supports these results for the perirhinal mediation of object-based pattern separation (Bussey et al., 2002; Norman & Eacott, 2004). In studies with humans, a modified continuous recognition task was used. In one study with young participants using high resolution fMRI with this task, it was found that the hippocampus distinguished among correctly identified true stimulus repetitions, correctly rejected presentations of similar lure stimuli, and false alarm lures (Kirwan & Stark, 2007). In a subsequent study it was shown that in aged compared to young participants that the DG/CA3 subregions of the hippocampus played an important role in deficits found in aged participants (Yassa et al., 2010). For a review of the human pattern separation data see (Yassa & Stark, 2011). Working memory and pattern separation for odor information was assessed in rats using a matching-to-sample for odors paradigm. The odor set consisted of a five aliphatic acids with unbranched carbon chains that varied from two-six carbons in length. Each trial consisted of a sample phase followed by a choice phase. During the sample phase, rats would receive one of five different odors. During the choice phase 15 s later, one of the previous odors was presented simultaneously side by side with a different odor that was based on the number of aliphatic acids that varied in the carbon chains from two-six carbons in length and rats were allowed to choose between the two odors. The rule to be learned in order to receive a food reward was to always choose the odor that occurred during the study phase. Odor separations of 1, 2, 3 or 4 were selected for each choice phase which represented the carbon chain difference between the study phase odor and the test phase odor. Once an animal reached a criterion of 80-90% correct across all temporal separations based on the last 16 trials, rats received a control or ventral dentate gyrus lesion and were retested on the task. On postoperative trials, there were no deficits at the 15 s delay for either the controls or the ventral dentateyrus lesioned rats. However, when the delay was increased o 60 s, rats with ventral DG lesions were significantly impaired at short spatial separations and performance of DGlesioned animals increased as a function of greater spatial separation between the correct and foil objects. The performance of rats with ventral DG lesions matched control rats at the largest odor based separation. The graded nature of the impairment and the significant linear improvement in performance as a function of increased separation illustrate a deficit in odor pattern separation. Based on these results, it was concluded that lesions of the ventral DG decrease the efficiency of odor based pattern separation, which results in impairments on trials with increased spatial proximity and increased odor similarity among working memory representations (Weeden, Hu, Ho, & Kesner, 2012). The data suggest that the ventral hippocampus, but not dorsal hippocampus, supports pattern separation for odor information. In summary, within the event-based memory system, different brain regions process different attributes in support of short-term or working memory and pattern separation processes. Data are presented to support this assertion by demonstrating that the dorsal hippocampus mediates spatial and temporal attribute information, the caudate mediates response attribute information, the amygdala mediates affect attribute information, the perirhinal cortex mediates sensory-perceptual attribute information for visual objects, the ventral hippocampus mediates sensory-perceptual attribute information for odors, and the hippocampus mediates language attribute information. Where data are available, there are parallel results found in rodents, monkeys and humans. The organization of the attributes within the knowledge-based memory system can take many forms and they are assumed to be organized as a set of cognitive maps or neural nets, the interactions of which are unique for each memory. It is assumed that long-term representations within cognitive maps are more abstract and less dependent upon specific features. Some interactions between attributes are important and can aid in identifying specific neural regions that might subserve a critical interaction. For example, the interaction between sensory-perceptual attributes and the spatial attribute can provide for the long-term memory representation of a spatial cognitive map or spatial schemas, the interaction between temporal and spatial attributes can provide for the long-term memory representation of scripts, the interaction between temporal and affect attributes can provide for the long-term memory representation of moods, and the interaction between sensory-perceptual and response attributes can provide for the long-term memory of skills. Based on a series of experiments, it can be shown that within the knowledge-based memory system, different neural structures and circuits mediate different forms or attributes of memory. The most extensive data set is based on the use of paradigms that measure repetition priming, the acquisition of new information, discrimination performance, executive functions, strategies and rules to perform in a variety of tasks including skills and the operation of a variety of long-term memory programs. For the knowledge-based memory system, I will concentrate on specific processes that mediate perceptual memory within long-term memory. For the other processes, including selective attention and selective filtering associated with permanent memory representations of familiar information, selection of strategies and rules (“executive functions”), and retrieval of familiar information based on flexibility and action, the establishment of arbitrary associations, consolidation or elaborative rehearsal of new information, and retrieval of new information based on flexibility, action, and pattern completion, there is not a sufficient data set to differentiate the contribution of the different attributes associated with mnemonic processing of information. The emphasis will be on the role of the parietal cortex (PPC) in perceptual and long-term memory processing of complex spatial information within the knowledge-based memory system, see Figure 4 for the location of the PPC in rats. Rats with PPC lesions display deficits in both the acquisition and retention of spatial navigation tasks that are presumed to measure the operation of a spatial cognitive map within a complex environment (DiMattia & Kesner, 1988b; Kesner, Farnsworth, & Kametani, 1992). They also display deficits in the acquisition and retention of spatial recognition memory for a list of five spatial locations (DiMattia & Kesner, 1988a). In a complex discrimination task in which a rat has to detect the change in location of an object in a scene, rats with PPC lesions are profoundly impaired (DeCoteau & Kesner, 1996), yet on less complex tasks involving the discrimination or short-term memory for single spatial features including spatial location, allocentric and egocentric spatial distance (Long & Kesner, 1996) there are no impairments. When the task is more complex, involving the association of objects and places (components of a spatial cognitive map), then PPC plays an important role. Support for this conclusion comes from the finding that rats with PPC lesions are impaired in the acquisition and retention of a spatial location plus object discrimination (paired associate task), but show no deficits for only spatial or object discriminations (Long et al., 1998). Comparable deficits are found within an egocentric-allocentric distance paired associate task (Long & Kesner, 1996), but there is no deficit for an object-object paired associate task, suggesting that spatial features are essential in activating and involving the PPC (unpublished observations). Finally, it should be noted that in rats, neurons have been found within the PPC that encode spatial location and head direction information and that many of these cells are sensitive to multiple cues including visual, proprioceptive, sensorimotor and vestibular cue information (Chen, Lin, Barnes, & McNaughton, 1994; McNaughton, Chen, & Marcus, 1991). Additional support comes from studies with parietal lesioned monkeys. These animals demonstrate deficits in place reversal, landmark reversal, distance discrimination, bent wire route-finding, pattern string-finding, and maze-learning tasks (Milner, Ockleford, & DeWar, 1977; Petrides & Iversen, 1979; Pohl, 1973). Figure 4. 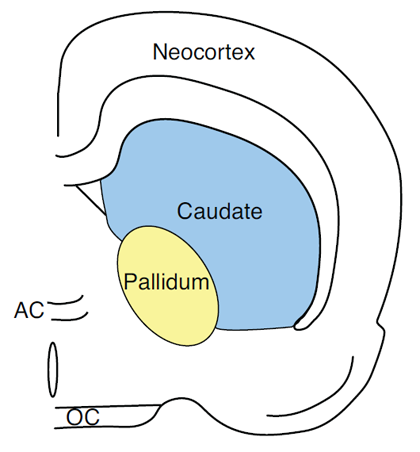 Pictorial representation of the posterior parietal cortex (PPC) and TE2 cortex in the rat. In a somewhat different study, rats with PPC lesions are impaired in an implicit spatial repetition priming experiment but perform without difficulty in processing positive priming for features of visual objects and a short-term or working memory for a spatial location experiment (Chiba, Kesner, & Jackson, 2002), suggesting that the parietal cortex plays a role in spatial perceptual memory within the knowledge-based memory system, but does not play a role in spatial memory within the event-based memory system.In humans there is a general loss of topographic sense, which may involve loss of long-term geographical knowledge as well as an inability to form cognitive maps of new environments. Using PET scan and functional MRI data, it can be shown that complex spatial information results in activation of the parietal cortex (Ungerleider, 1995). Thus, memory for complex spatial information appears to be impaired (Benton, 1969; De Renzi, 1982). Furthermore, in patients with parietal lesions and spatial neglect, there is a deficit in spatial repetition priming without a loss in short-term or working memory for spatial information (Ellis, Sala, & Logie, 1996). Keane, et al. (1995) reported that a patient with occipital-lobe damage (extending into PC) showed a deficit in perceptual priming but had no effect on recognition memory, whereas a patient with bilateral medial temporal lobe damage (including hippocampus) had a loss of recognition memory, but no loss of perceptual memory. The emphasis will be on visual perceptual processing within the knowledge-based system, see Figure 4 for the location of the TE2 cortex in the rat. I will concentrate on temporal cortex (TE2) and make comparisons with the (PPC). In rats using a visual object-place recognition task, TE2 lesioned rats fail to detect a visual object change, whereas PPC lesioned rats fail to detect a spatial location change (Tees, 1999) suggesting that the two cortical areas play a distinctive role in perceptual processing of visual versus spatial location information. Similar results were reported by Ho et al. (2011) who showed that rats with TE2 lesions had object recognition problems at 20 min, but not at 5 min delays. In rats there is a deficit in processing positive priming for features of visual objects (a component of perceptual memory system), but the rats performed well in positive priming for spatial location (Kesner, unpublished observations). In monkeys deficits for visual objects and in a working memory task and visual paired comparison task were observed following TE2 deficits suggesting that TE2 cortex may play an important role in visual perceptual processing (Buffalo et al., 1999). It can also be shown that lesions of the inferotemporal cortex in monkeys and humans and temporal cortex (TE2) in rats result in visual object discrimination problems (Dean, 1990; Fuster,1995; Gross, 1973; McCarthy & Warrington, 1990; Weiskrantz & Saunders, 1984), suggesting that the inferotemporal or TE2 may play an important role in mediating long-term representations of visual object information. Additional support comes from PET scan and functional MRI data in humans, where it can be shown that visual object information results in activation of inferotemporal cortex (Ungerleider, 1995). In a somewhat different study, Sakai and Miyashita (1991) have shown that neurons within the inferotemporal cortex responded more readily after training to a complex visual stimulus that had been paired with another complex visual stimulus across a delay, suggesting the formation of long-term representations of objectobject pairs. In summary, within the knowledge-based memory system, different brain regions process different attributes in support of perceptual processes. Data are presented to support this assertion by demonstrating that the PPC mediates the spatial attribute for spatial perceptual information and the TE2 cortex mediates the sensory-perceptual attribute for visual object information. Where data are available, there are parallel results found in rodents, monkeys and humans. For the rule-based memory system, it is assumed that there is integration of information from the event-based and knowledge-based memory systems for the use of major processes that include the selection of strategies and rules for maintaining or manipulating information for subsequent decision making and action as well as short-term or working memory for new and familiar information. I will concentrate on two processes, namely working (short-term memory) and paired associate learning and I will emphasize the importance of prefrontal cortex (PFC) subregions in the mediation of different attributes. Figure 5 depicts the organization of the PFC in the rat. Working or short-term memory is a process for short-term active maintenance of information as well as for processing maintained information. The most extensive data set aimed at addressing the role of the different PFC subregions in supporting different forms of working memory is based on experiments using paradigms that measure short-term or working memory in tasks such as matching or non-matching-to-sample for single or lists of items, continuous or nback recognition memory, and novelty detection based on recognition memory. Figure 5. Frontal areas of the rat: A. Medial View. B. Ventral view. Abbreviations: PrCm (PC)-precentral cortex; ACdorsal and ventral anterior cingulate; PL-IL-prelimbic and infralimbic cortex; MO-medial orbital cortex; AI-dorsal and ventral agranular insular cortex; LO-lateral orbital cortex; VO-ventral orbital cortex; VLO-ventrolateral orbital cortex. Evidence supporting a role for the rat PFC in working memory is based on the findings that lesions of the anterior cingulate and precentral (AC/PC) cortex that spare the prelimbic-infralimbic (PL/IL) cortex produce a deficit in working memory for motor response information such as working memory for a motor (right-left turn) response (Kesner, Hunt, Williams, & Long, 1996; Ragozzino & Kesner, 2001), but not working memory for visual object (Ennaceur, Neave, & Aggleton, 1997; Kesner et al., 1996; Shaw & Aggleton, 1993), or affect (food reward value) information, (DeCoteau, Kesner, & Williams, 1997; Ragozzino & Kesner, 1999). There are also no deficits, with a few exceptions, in working memory for spatial information using delayed non-matching to position, delayed spatial alternation, or non-matching-to sample in a T- maze, 8 arm maze, and continuous spatial recognition memory procedures (Ennaceur et al., 1997; Harrison & Mair, 1996; Kesner et al., 1996; Kolb, Sutherland, & Whishaw, 1983; Passingham, Myers, Rawlins, Lightfoot, & Fearn, 1988; Ragozzino, Adams, & Kesner, 1998; Sanchez-Santed, deBruin, Heinsbroek, & Verwer, 1997; Shaw & Aggleton, 1993). Thus, the data suggest that the AC cortex and PC cortex process working memory for motor response information, but do not process working memory for visual object, spatial, or affect (food value) information. In monkeys, enhanced single unit activity was recorded in the premotor cortex in relation to the go and no-go component of a delayed conditional go/no go task, suggesting an involvement of the premotor cortex in a working memory task component associated with motor movement (Watanabe, 1986). Recent work with humans using fMRI techniques showed that activation was observed in the premotor cortex in a delayed response task (Turner & Levine, 2006).The PL-IL cortex appears to play an important role in working memory for visual object and spatial location information. Supporting evidence is based on the findings that lesions of the PL-IL cortex produce deficits in working memory for spatial information (Brito & Brito, 1990; Delatour & Gisquet-Verrier, 1996; Granon, Vidal, Thinus-Blanc, Changeux, & Poucet, 1994; Horst & Laubach, 2009; Ragozzino et al., 1998; Seamans, Floresco, & Phillips, 1995), and working memory for visual object information (Di Pietro, Black, Green-Jordan, Eichenbaum, & Kantak, 2004; Kesner et al., 1996; Ragozzino, Detrick, & Kesner, 2001). However, PL-IL lesions do not produce a deficit in working memory for a food reward (DeCoteau et al., 1997; Ragozzino & Kesner, 1999). Further support of this conclusion was reported by Chang, Chen, Luo, Shi, and Woodward (2002), who found sustained neural firing in the PL-IL cortex during the delay within a delayed matching-to-position task, and Baeg et al. (2003) who recorded from the PL-IL cortex in a spatial delayed alternation task reported an increase in neural firing during the delay period. In early research, Goldman-Rakic (1987, 1996) proposed that one could fractionate functions of the PFC on the basis of differential subregional contributions. She suggested that the main function of the PFC is to support working memory defined as a specialized process by which a remembered stimulus is held on line to guide behavior in the absence of external cues. Furthermore, she postulated a modular organization of working memory based on the use of different domains or attributes of information processing. This is called the domain-specificity model, which would be consistent with the attribute model. In monkeys, the cortex surrounding the principal sulcus (dorsolateral prefrontal cortex) is specialized for on line processing of spatial information, whereas the inferior convexity (ventrolateral prefrontal cortex) is specialized for on-line processing of visual object information. In addition, the ventrolateral prefrontal cortex could also support other sensory domains. Support for this model is based on the observation of delay-specific cells in the dorsolateral prefrontal cortex for only spatial tasks, such as delayed response, delayed alternation, and delayed oculomotor tasks, and the observation that lesions of the dorsolateral prefrontal cortex disrupt performance on a delayed response, delayed alternation, delayed oculomotor, and spatial search tasks (Butters & Pandya, 1969; Funahashi, Bruce, & Goldman-Rakic, 1993; Goldman & Rosvold, 1970; Mishkin, 1957; Passingham, 1985). In contrast, delay-specific cells for a visual object delay task are found in the ventrolateral prefrontal cortex and lesions in this area disrupt visual object recognition (Mishkin & Manning, 1978; Wilson, Scalaidhe, & Goldman-Rakic, 1993). 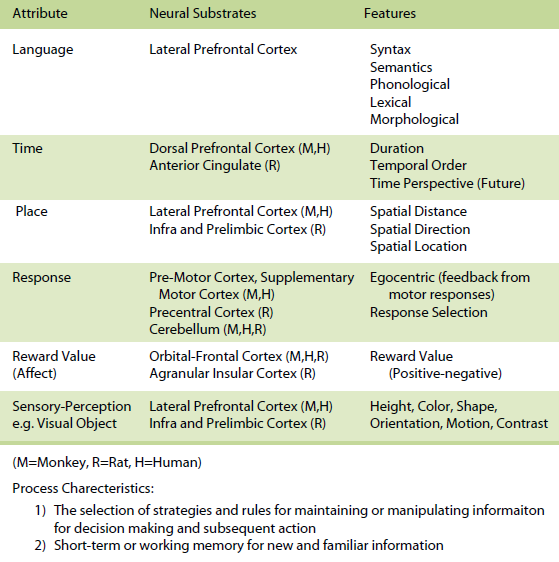 Challenges to Goldman-Rakic’s domain specificity model for working memory as the main organizing principle for the prefrontal cortex have emerged based on research with monkeys and humans. First, Rao, Rainer, and Miller (1997) have shown that one can record both spatial location and visual object information from the same cell within the dorsolateral prefrontal cortex and these cells can change very readily based on the demands of the task. Second, Fuster, Bauer, and Jervey (1982) showed that delay cells can be found in both the dorsolateral and ventrolateral prefrontal cortex in a visual-visual stimulus or spatial location-spatial location matching-to-sample tasks. In humans, D’Esposito et al. (1998) reported a meta-analysis of neuroimaging results based on visual object and spatial location working memory tasks which provided a strong case for processing of both visual object and spatial location information in working memory in both the dorsolateral and ventrolateral prefrontal cortex. Similar findings based on a meta-analysis of sixty PET and fMRI studies using working memory paradigms were reported by Wager and Smith (2003), showing that working memory for spatial and object location information resulted in activation of the ventral and dorsolateral prefrontal cortex. Using another meta-analytic review, Owen (2000) reported results that support the findings mentioned in the above studies. Thus, it is clear that there is a large body of evidence based on recording and lesion studies supporting a working memory or short-term memory role for the PL-IL cortex in rats and the ventral and dorsolateral frontal cortex in monkeys and humans in working memory for spatial locations and objects. Based on anatomical and behavioral data, the agranular insular and lateral orbital (AI/LO) cortex appears to play an important role in working memory for affect attribute information based on odor and taste. Supporting evidence is based on the findings that lesions of the AI/LO cortex produce deficits in working memory for affect based on taste or odor information (DeCoteau et al., 1997; Di Pietro et al., 2004; Otto & Eichenbaum, 1992; Ragozzino & Kesner, 1999). Further support can be found in a study where sustained neuronal firing was observed in the AI/LO cortex during the delay period in a non-matching-to-sample for odors task (Ramus & Eichenbaum, 2000). It should be noted that AI/LO cortical lesions do not produce an effect on visual object or spatial working memory (DeCoteau et al., 1997; Di Pietro et al., 2004; Horst & Laubach, 2009; Ragozzino & Kesner, 1999), although in a recent study there were deficits using a delayed alternation task for odors with lesions of the PL-IL cortex, but there was extra damage to the AI/LO cortex (Kinoshita et al., 2008). Deficits in short-term memory for odors have been reported following damage to the orbital frontal cortex in humans (Jones-Gotman & Zatorre, 1993). Furthermore, Dade et al. (2001) reported increased activity based on PET scans in the orbital frontal cortex as well as dorsal and ventral lateral prefrontal cortex in an n-back task based on odor information. In summary, within the rule-based memory system, different brain regions process different attributes in support of short-term or working memory. Data are presented to support this assertion by demonstrating that the AC/PC cortex mediates response attribute information, the PL/IL mediates spatial location and visual object attribute information, and AI/OL cortex mediates odor and taste information within the sensory-perceptual attribute. It appears that the different regions can be dissociated from each other based on specific attributes. Parallel results are found in monkeys and humans in that response information is mediated by the premotor cortex, spatial location and visual object information are mediated by the dorsal and ventral lateral prefrontal cortex, and odor and taste information are mediated by the orbital frontal cortex. It is assumed that in addition to processing of temporal information, the prefrontal cortex is also involved in mediating higher-order processes, such as rule learning based on the use of biconditional discrimination or paired associate paradigms. Passingham et al. (1988) showed that lesions of the AC and PC cortex in rats resulted in deficits in a visual conditional motor associative task. Similar results with the same type of lesion and the same visual conditional motor associative task were reported by (St-Laurent, Petrides, & Sziklas, 2009). Based on behavioral and anatomical data, the PC cortex in the rat is assumed to be homologous to the premotor and supplementary motor area in monkeys and humans (periarcuate or posterior dorsal lateral area; Brodmann areas 6 and 8) in that the deficits observed in the visual-response conditional task and working memory for a motor response task in rats are rather similar to what has been described for monkeys and humans. For example, in monkeys, Halsband and Passingham (1985) showed that the premotor cortex is directly involved in mediating a visual-conditional motor task, but not a visual conditional non-motor task, suggesting that the response component is critical. Similar deficits in a visual conditional response task following premotor cortex lesions have been found in monkeys and humans (Halsband & Freund, 1990; Petrides, 1982, 1985a, 1997). Based on fMRI analysis of learning arbitrary visual-response associations, increased activity in the dorsal premotor cortex (Toni, Ramnani, Josephs, Ashburner, & Passingham, 2001) has been observed in addition to supplementary motor cortex interacting with dorsolateral prefrontal cortex (Boettiger & D’Esposito, 2005). In a different set of studies, it has been shown that rats with lesions of the PL/IL, but not of the AC and PC cortex, fail to acquire an object-place association (Kesner & Ragozzino, 2003). In a subsequent study Lee and Solivan (2008) showed that temporary inactivation of the PL/IL cortex with muscimol led to profound impairments in an object-place paired association task. Furthermore, impairment in a novelty detection paradigm using an object-in-place learning task has been observed in in rats with PL/IL lesions (Barker, Bird, Alexander, & Warburton, 2007). Based on a different set of arbitrary associations, it has been shown in rats that lesions of AI/LO impair the learning of a cross-modal association involving odor and tactile stimuli (Whishaw, Tomie, & Kolb, 1992). Furthermore, based on single unit recording within the OL cortex of rats, it was found that many neurons were active during odor-location learning. In monkeys, in the orbital frontal cortex, many neurons were activated by both taste and odor stimuli (Rolls & Baylis, 1994), suggesting that flavor may be processed by orbital frontal cortex leading to pleasant experiences often associated with reward. In humans, Small et al. (1999) showed that based on fMRI data there was activation of the orbital frontal cortex during the processing of taste and odor information. In the context of other types of paired associate learning, Petrides (1985b) has shown that humans with PFC cortex lesions have difficulty in learning a paired associate task and Pigott and Milner (1993) reported that frontal lobe damaged patients are impaired for objects and places in a complex visual scene task. Also, Klingberg and Roland (1998) showed that based on PET scans, the dorsal lateral prefrontal and anterior cingulate cortex are activated during new learning of visual-auditory paired associates. There are many interactions among the three systems. I will present just one example, namely an interaction between the prefrontal cortex (rule-based system) and hippocampus (event-based memory system) in the context of temporal processing of short-term memory information. In this study Lee and Kesner (2003) examined the dynamic interactions between the prefrontal cortex and hippocampus by training and testing rats on a delayed non-matching-to-place task on a radial 8-arm maze requiring memory for a single spatial location following short-term (i.e., 10 s or 5 min) delays. The results showed that inactivating both regions at the same time resulted in a severe impairment of short-term and intermediate memory for spatial information, suggesting that one of the structures needs to function properly for intact processing of short-term or intermediate-term spatial memory. Thus, the two regions interact with each other to ensure the processing of spatial information oveer a dynamic temporal range including both short-term and intermediate term memory. The current results provide compelling evidence indicating that a mnemonic time window is a critical factor in dissociating the function of the hippocampal system from that of the medial prefrontal cortex in a delayed choice task. That is, the dorsal hippocampus and medial prefrontal cortex appear to process spatial memory in parallel within a shortterm range, whereas the dorsal hippocampal function becomes more essential once the critical time window requires spatial memory for a time period exceeding that range. In summary, within the rule-based memory system different brain regions process different attributes in support of paired associate learning. Data are presented to support this assertion by demonstrating that the PC cortex mediates associative processes based on a visual conditional response learning, the PL/IL cortex mediates associative processes based on visual-spatial learning, and AI/LO cortex mediates associative processes based primarily on odor-taste learning. PPC mediates the spatial attribute for spatial perceptual information and the TE2 cortex mediates the sensory-perceptual attribute for visual object information. Parallel results are found in monkeys and humans in that for monkeys and humans the premotor mediates associative processes based on visual conditional response learning, the dorsal and ventral lateral prefrontal cortex mediate object-place learning, and the orbital prefrontal cortex mediates odor-taste associations. I will compare the tripartite attribute model with the O’Keefe and Nadel (1978) and Moscovitch et al. (2005); the Squire (1994) and Squire et al. (2004); and the Cohen and Eichenbaum, (1993), Eichenbaum (2004) and Eichenbaum et al., (2007) models. I will apply Schacter and Tulving (1994) suggestion that one needs to define memory systems in terms of the kind of information to be represented, the processes associated with the operation of each system, and the neurobiological substrates including neural structures and mechanisms that subserve each system. O’Keefe and Nadel (1978) have concentrated on the role of the hippocampus as the neurobiological substrate in processing spatial and contextual information and more recently Nadel and Moscovitch (1998) have suggested that the hippocampus stores episodic memory. They do suggest that transfer of episodic information to the neocortex can occur to store semantic memories. The tripartite attribute model does not accept that all episodic (event-based) memories are stored in the hippocampus and emphasizes that the hippocampus supports temporal, odor, and language information in addition to space and context. The tripartite attribute model also states that new information is stored in a semantic or knowledge-based memory system via a consolidation process, but the model emphasizes that different neocortical areas store different attributes of memory which utilizes different processes from the event-based memory system, such as perception, selective attention, and implicit memory. The Nadel model does not incorporate the prefrontal cortex in their memory model. Squire proposes a declarative versus non-declarative system long-term memory model (Squire 1994; Squire et al., (2004). It is assumed that the declarative memory system is based on explicit information that is easily accessible and is concerned with specific facts or data. It includes episodic and semantic representations of propositions and images. On the other hand, the non-declarative memory system is based on implicit information that is not easily accessible and includes unaware representations of motor, perceptual, and cognitive skills, as well as priming, simple classical conditioning, and non-associative learning. In this model the hippocampus and interconnected neural regions, such a perirhinal cortex, postrhinal/parahippocampal gyrus, and entorhinal cortex encompasses the medial temporal lobe and is assumed to be the critical neural substrate in mediating all forms of memory within the declarative memory system. The non-declarative memory system include the mediation of skills and habits by the striatum, priming by the neocortex, simple classical conditioning of emotional responses by the amygdala, simple classical conditioning of skeletal musculature by the cerebellum, and non-associative learning by reflex pathways. It is assumed that the two memory systems are independent of each other. The Squire model assumes that the declarative memory system is based on conscious awareness and is involved in consolidation, and that all the areas of the medial temporal lobe are critical for recollection of all types of sensory information. In the tripartite attribute model, I do not differentiate the attributes on the basis of conscious awareness. Furthermore, I assume that for each attribute, the same processes operate in the event-based memory system and thus, non-declarative memory does not operate in the tripartite attribute model. In my model, the perirhinal cortex and hippocampus subserve different attribute information, such as object information and spatial information, respectively. Also, the prefrontal cortex is not usually incorporated in a specific memory system and the emphasis has not been on the different attributes of memory. Cohen and Eichenbaum, (1993) and Eichenbaum (2004) propose that the declarative memory system is dependent upon the hippocampus, which provides a substrate for relational representation of all forms of memory including conjunctive, configural and arbitrary associations, as well as representational flexibility allowing for the retrieval of memories in novel situations. In contrast, the procedural system is independent of the hippocampus and is characterized by individual representations and inflexibility in retrieving memories in novel situations. In contrast to this declarative/non-declarative perspective, relational memory theory proposes that the medial temporal lobe function is independent of conscious awareness. Recently, a model for episodic recognition memory was proposed and extended by Eichenbaum et al, (2007). 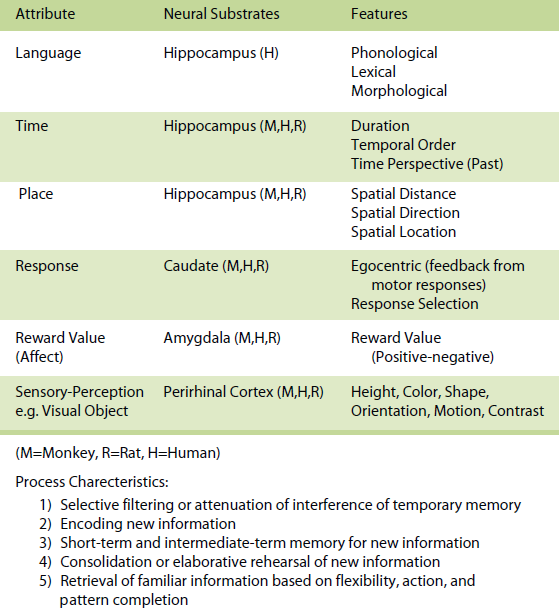 This model, called the Binding Items and Context (BIC) model, proposed that information pertaining to item identity (i.e., “what”) resides primarily in the perirhinal cortex and information pertaining to the context wherein an item was experienced (i.e., “where”) resides primarily in the postrhinal/parahippocampal cortex. The item and context information are transmitted through the lateral and medial entorhinal cortices, respectively, and they enter the hippocampus, at which point the item and the context are bound together into coherent episodes. I assume that for each attribute the same processes operate in the event-based memory system and thus, the different components of the medial temporal lobe utilize similar functions. Even though Eichenbaum is clearly aware of the importance of the prefrontal cortex in its interactions with the hippocampus, the prefrontal cortex is not included in the overall memory model. Memory is a complex phenomenon due to a large number of potential interactions that are associated with the organization of memory at the psychological and neural system level. Thus, it is not surprising that there many different models of memory (see other theories of memory section). In the Kesner tripartite, multiple attribute, multiple process memory model, different forms of memory and its neurobiological underpinnings are represented in terms of the nature, structure, or content of information representation as a set of different attributes including language, time, place, response, reward value (affect), and visual object as an example of sensory-perception. For each attribute, information is processed in the event-based memory system through a variety of operations but especially for short-term and intermediate-term memory and pattern separation based on orthogonalization of specific attribute information. In addition, for each attribute, information is processed in the knowledge-based system through a variety of operations, but especially for long-term storage and perceptual memory. Finally, for each attribute, it is assumed that information is processed in the rule-based memory system through the integration of information from the event-based and knowledge-based memory systems for the use for major processes that include especially short-term or working memory and paired associate learning. The neural systems that subserve specific attributes within a system can operate independent of each other, even though there are also many possibilities for interactions among the attributes. Although the event-based and knowledge-based memory systems are supported by neural substrates and different operating characteristics, suggesting that the two systems can operate independent of each other, there are also important interactions between the two systems, especially during the consolidation of new information and retrieval of previously stored information. Finally, because it is assumed that the rule-based system is influenced by the integration of event-based and knowledge-based memory information, there should be important interactions between the event-based and knowledge-based memory systems and the rule-based memory system. Thus, for each attribute, there is a neural circuit that encompasses all three memory systems in representing specific attribute information. In general, the tripartite attribute memory model represents the most comprehensive memory model capable of integrating the extant knowledge concerning the neural system representation of memory. It is important to note the new information that has been obtained during the last decade. For the event-based memory system there has been (a) an extensive elaboration of the temporal attribute in terms of memory for duration, memory for sequential spatial processing, and memory for the sensory-perceptual attribute based on the operation of short-term memory or working memory, and (b) an emphasis on the characterization of an attribute-based pattern separation process. For the knowledge-based memory system, only a few studies have been added. For the rule-based memory system there has been a more elaborate detailed delineation of the different subregions of the prefrontal cortex in mediating working memory and paired associate learning, as well as a discussion of potential interactions between the event-based and rule-based memory systems. Banks, W. P. (1978). Encoding and processing of symbolic information in comparative judgements. In G. H. Bower (Ed. ), The psychology of learning and motivation: Advances in theory and research (pp. 101–159). New York: Academic. Benton, A. L. (1969). Disorder of spatial orientation. In P. J. Vinken & G. W. Bruyn (Eds. ), Handbook of clinical neurology (Vol. 3). Amsterdam: North Holland. Chiba, A. A., Johnson, D. L., & Kesner, R. P. (1992). The effects of lesions of the dorsal hippocampus or the ventral hippocampus on performance of a spatial location order recognition task. Society for Neuroscience Abstract, 18, 1422. Chiba, A. A., Kesner, R. P., Matsuo, F., & Heilbrun, M. P. (1990). A dissociation between verbal and spatial memory following unilateral temporal lobectomy. Society for Neuroscience Abstracts, 16, 286. Chiba, A. A., Kesner, R. P., Matsuo, F., & Heilbrun, M. P. (1993). A dissociation between affect and recognition following unilateral temporal lobectomy including the amygdala. Society for Neuroscience Abstracts, 19, 792. De Renzi, E. (1982). Disorders of space exploration and cognition. New York: Wiley. Disterhoft, J. F., Carrillo, M. C., Hopkins, R. O., Gabrieli, J. D. E., & Kesner, R. P. (1996). Impaired trace eyeblink conditioning in severe medial temporal lobe amnesics. Society for Neuroscience Abstracts, 22, 1866. Estes, W. K. (1986). Memory for temporal information. In J. A. Michon & J. L. Jackson (Eds. ), Time, mind and behavior (pp. 151–168). New York: Springer-Verlag. Flaherty, C. F., Turovsky, J., Krauss, K. L. (1994). Relative hedonic value modulates anticipatory contrast. Physiology and Behavior, 55, 1047–1054. Fuster, J. M. (1995). Memory in the cerebral cortex: An empirical approach to neural networks in the human and nonhuman primate. Cambridge: MIT Press. Fuster, J. M., Bauer, R. H., & Jervey, J. P. (1982). Cellular discharge in the dorsolateral prefrontal cortex of the monkey in cognitive tasks. Cerebral Cortex, 4, 443-450. Gaffan, D. (1992). Amygdala and the memory of reward. In J. P. Aggleton (Ed. ), The amygdala: Neurobiological aspects of emotion, memory, and mental dysfunction. New York: Wiley-Liss. Gaffan, D., & Murray E. A. (1992). Monkeys (Macaca fascicularis) with rhinal cortex ablations succeed in object discrimination learning despite 24-hr intertrial intervals and fail at matching to sample despite double sample presentations. Behavioral Neuroscience, 106, 30-38. Goldman-Rakic, P. S. (1987). Circuitry of primate prefrontal cortex and regulation of behavior by representational memory. In F. Plum & V. Mountcastle (Eds. ), Handbook of physiology: The nervous system (pp. 373-417). Bethesda: American Physiological Society. Hopkins, R. O. & Kesner, R. P. (1993). Memory for temporal and spatial distances for new and previously learned geographical information in hypoxic subjects. Paper presented at the Society for Neuroscience Meeting, Washington, DC. Hopkins, R. O., & Kesner, R. P. (1994). Short-term memory for duration in hypoxic subjects. Society for Neuroscience Abstracts, 20, 1075. Hunsaker, M. R., Mooy, G. G., Swift, J. S., & Kesner, R. P. (2007). Dissociations of the medial and lateral perforant path projections into dorsal DG, CA3, and CA1 for spatial and nonspatial (visual object) information processing. Behavioral Neuroscience, 121, 742-750. Kesner, R. P. (2000). Subregional analysis of mnemonic functions of the prefrontal cortex in the rat. Psychobiology, 28, 219-228. Kubie, J. L., & Ranck, J. B. (1983). Sensory-behavioral correlates in individual hippocampal neurons in three situations: Space and context. In W. Seifert (Ed. ), Neurobiology of the hippocampus (pp. 433-447). New York: Academic. Lee, I., & Solivan, F. (2008). The roles of the medial prefrontal cortex and hippocampus in a spatial paired-association task. Learning and Memory, 15, 357-367. Long, J. M., Mellem, J. E., & Kesner, R. P. (1998). The effects of parietal cortex lesions on an object/spatial location paired-associate task in rats. Psychobiology, 26, 128-133. Milner, A. D., Ockleford, E. M., & DeWar, W. (1977). Visuo-spatial performance following posterior parietal and lateral frontal lesions in stumptail macaques. Cortex, 13, 170-183. Mishkin, M. (1957). Effects of small prefrontal lesions on delayed alternation in monkeys. Journal of Neurophysiology, 220, 615-622. Mumby, D. G., Wood, E. R., & Pinel, J. P. J. (1992). Object recognition memory is only mildly impaired in rats with lesions of the hippocampus and amygdala. Psychobiology, 20, 18-27. Myers, C. E., Gluck, M. A., & Granger, R. (1995). Dissociation of hippocampal and entorhinal function in associative learning: A computational approach. Psychobiology, 23, 116-138. Nadel, L., & Moscovitch, M. (1998) Hippocampal contributions to cortical plasticity. Neuropharmacology, 37, 431–439. Oberg, R. G. E., & Divac, I. (1979). “Cognitive” functions of the neostriatum. In I. Divac & R. G. E. Oberg (Eds. ), The neostriatum (pp. 291-313). Oxford: Pergamon. O’Keefe J. & Nadel L. (1978). The hippocampus as a cognitive map. Oxford: Clarendon Press. O’Keefe, J. (1983). Spatial memory within and without the hippocampal system. In W. Seifert (Ed. ), Neurobiology of the hippocampus (pp. 375-403). London: Academic. Olton, D. S. (1983). Memory functions and the hippocampus. In W. Seifert (Ed. ), Neurobiology of the hippocampus. New York: Academic. Pasquier, F., Van Der Linden, M., Lefebvre, C., Bruyer, R., & Petit, H. (1994). Motor memory and the preselection effect in Huntington’s and Parkinson’s disease. Neuropsychologia, 32, 951-968. Quirk, G. J., Muller, R. U., Kubie, J. L.,& Ranck, J. B. Jr. (1992). The positional firing properties of medial entorhinal neurons: Description and comparison with hippocampal place cells. The Journal of Neuroscience, 12, 1945-1963. Rolls, E. T. (1989). Functions of neuronal networks in the hippocampus and neocortex in memory. In J. H. Bryne & W.O. Berry (Eds. ), Neural models of plasticity: Experimental and theoretical approaches (pp. 240–265). San Diego: Academic. Schacter, D. L., & Tulving, E. (Eds.). (1994). Memory systems 1994. Cambridge: MIT Press. Squire, L. R. (1994). Declarative and nondeclarative memory: Multiple brain systems supporting learning and memory. In D. L. Schacter & E. Tulving (Eds. ), Memory systems 1994 (pp. 203-231). Cambridge: MIT Press. St-Laurent, M., Petrides, M., & Sziklas, V. (2009). Does the cingulate cortex contribute to spatial conditional associative learning in the rat? Hippocampus, 19, 612-622. Tulving, E. (1983). Elements of episodic memory. Oxford: Clarendon. Weeden, C. S. S. , Hu, N. J., Ho, L. Y. N. & Kesner, R. P. (2012). The role of the ventral dentate gyrus in olfactory learning and memory. Society for Neuroscience Abstracts.